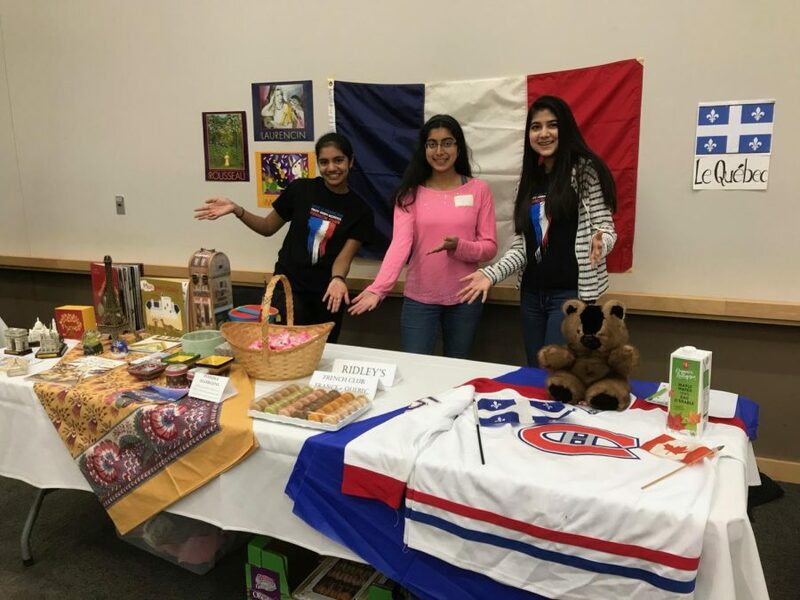 French Club with their table representing France and the French-speaking Canadian province of Quebec. The Troy Public Library-sponsored International Fair, which took place at the Troy Community Center, was a celebration of global cultures present within the local community. On Saturday, Nov. 17th, from 1 to 4 p.m., colorful tables lined the Banquet Hall, each one exhibiting a country’s products and staple elements of that country’s culture, such as food. Many of the tables were organized by clubs from school. Spanish club was representing Spain and Costa Rica, and were handing out churros at their table. Korean club was representing South Korea. Cultural clubs like Korean, French and Spanish clubs weren’t the only ones in attendance. She’s the First had a table set up with cultural products from Ethiopia. During the event, different groups from around Troy gave cultural performances. The Troy High Fiddlers opened the event, followed by K-pop dancers, a Russian song sung by students, and even a fashion show.